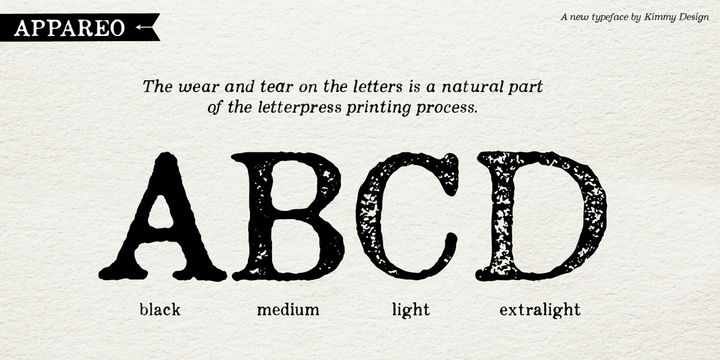 Appareo is an elegant worn font created by Kimmy Kirkwood and published by Kimmy Design. It offers great variety of typefaces of different intensity level, from ultra-light to extra-bold or black, thus satisfying all the customers` needs. It also provides an italics customizing version of each written symbol. Due to its Open Type characters, the number of authentic letter combinations is virtually unlimited. A truly inspirational and original type! A font description published on Thursday, September 12th, 2013 in Fonts, Kimmy Design by Iulia that has 6,112 views.